I took another look at the Andrews fork from the $100 low in gold, but used the "orthodox end" of the bear market vs. the "nominal price extreme" (to use RN Elliott's words). The result is here. 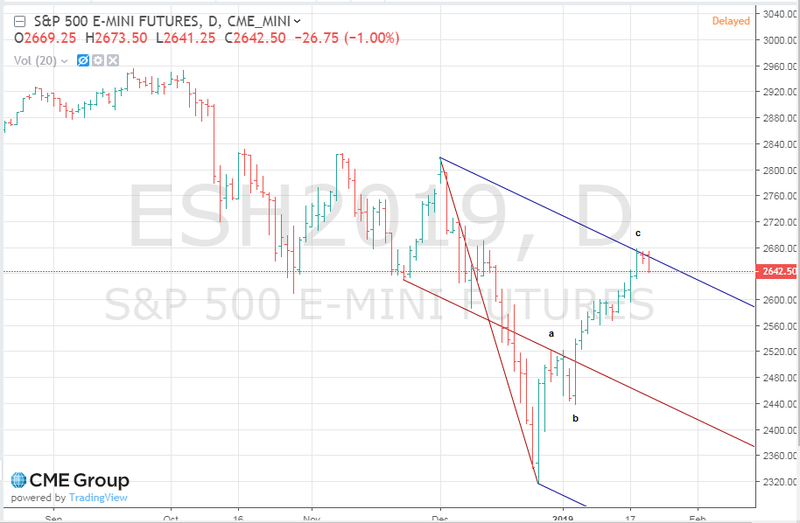 The termination of the parabolic wave on the Upper MLH after so much time elapsed is quite surprising--not unlike the recent wave 3 top of the ES chart (which has a perfect "Babson Fork"--an echo of the important pivot on the ML). We might well find that a return to the long term ML is in the cards, but I would only use it as a target (for a hedge or short) if other "local" lines confirm (i.e. create a confluence). We shall see! And yes, perhaps a drop to the Lower MLH of this grand fork is in the cards too--or perhaps to the Lower MLH of the fork using the "nominal price low". Possibly readers are not paying attention to the StarWars Hollywood (who lecture us on how to live !!) +Establishment battle vs fans affair and how that is going for the monied classes after 42 years. I did draw this to the fore during last year and ongoing watching has been like watching a slow motion four billion dollar chauffer driven limmo driving slowly and carefully over the only cliff in a thousand miles. Check out a visual synopsis, for a quickie take. that's after some serious remedial actions. Check the audience reviews if required. Low scored are accompanied by opinion and justifications and expressions of disappointments. Tops scores are sort of very very brief, as if somebody was short of time in their workplace and just wanted to get it done, or possibly was not a fan in the first place. This is the fans standing up to those who order them what to think and replying "FU we've had enough". Ordinary fans. Average people, not activists. And in France on the streets (everywhere though the media would have us believe it is just in Paris) the people who run things so incompetently for everybody other than themselves are getting ready to crack some ... fadeout here for good reasons. And in London ... well the UK government is having a tough time reconciling globalist EU forces with the half of the population that prefer Britain to be ruled from within Britain. Some deep thought as to ultra high alliances here is fruitful but I'm not going to go there in Setup! So ... look at the press critic scores in the above links. As the public rate the movies goes lower, the press critics have gone to 100%.. Invert the audience scores to get a vote of criticism. eg 100 - 15% positive = 85% critical in the scoring. Now I mention that the only reason the press support in Dr Who Resolution is not 100% is because one press critic rated it down after 7th January, and after it was abundantly clear audiences and fans hated it. And I also mention that many public who rated the last so low are female fans (who are clearly say they are disappointed that the first Dr Who with a female in the lead role was so crassly politicized, and so shallow. it's not a male misogynist fan thing, though the press love to level that accusation. So, as the public sentiment turned away from the official narrative, the media, in Spinal Tap style, "turned it up to 11". And London. And Paris. And around the globe, sentiment swings away from the people in charge who have screwed up so monumentally, and so stunningly failed at their jobs. Styxhexenhammer666 tends to get some and lose some when measured by my market calibrated filter. But he sees through the glossy facade usually and "gets" more than a whole lot of other social commentators. So his droll sarcasm tends to hit the mark pretty well. The first ten and last 30 seconds are priceless. And .... this is all occurring 8 years after the 2011 top in gold, and as gold rises towards next confrontation with the last three years trading range highs. It's time for the establishment's financiers to double up their bet or walk away. But they can't. So, will the best rearguard action, no doubt began with shock and awe, stop gold or not? The real players are coming onto the stage to sing. It could be a fat lady (to reuse the old showbiz term) or it could be the stormtroopers choir's first performance. Time for waiting for the next phase to arrive is up. We get either return of democracy or cranked up authority - starting imminently. 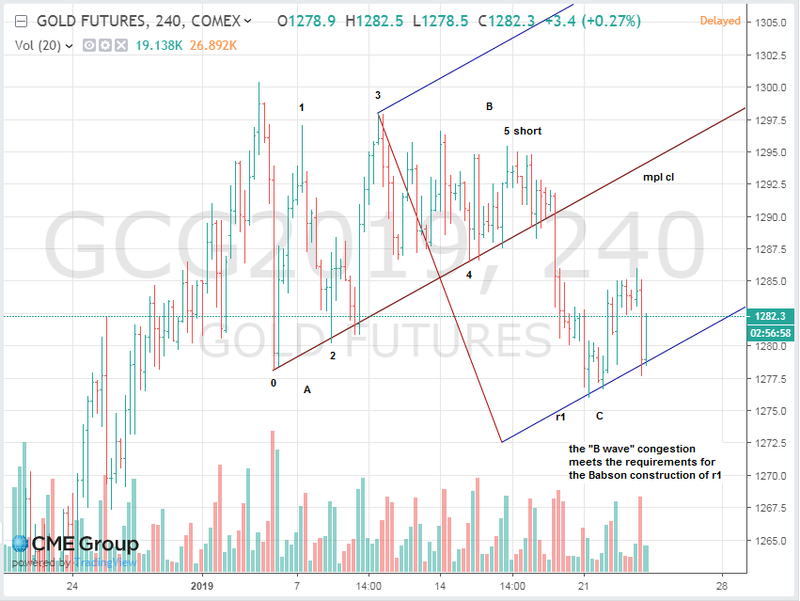 Gold has already moved into position for whichever choice manifests. Which means that GV effect from here on .... well ... it could be turbo charged for a while. Approx dates will be posted in Setup. I appreciate your taking a looksee and your comments. I have bisected the channel and ratioed it for shorter term insight into longer term of the fork. The prime ratio, as discussed ta the webinar is quite proximate to price, this is handy given the "important time". So as long as price gets/stays above the prime ratio support.resistance sub channel I can have a bullish stance, and below it .... ugh, but that insight is useful too because the major channel edges are as you have shown, and become the downside breakout scenario in that case. Isn't it hilarious how the conventional fork meshes with my less conventional one from the webinar? (That's no coincidence) There is a sort of crosshairs effect created by the two interacting together that hopefully can help us. I think your lower sub channel green up goes back to the 2006 high reasonably well. Whichever way the world chooses to go, "it" will tell us what we need to know about what "they" have decided. This preachy misandrous ad from Gillette already has 31000 dislikes to 4000 likes already. I expect it will get "ratioed" ten down to one up. It is difficult to believe they are so self sure in their anti men bigoted politics that they actually went ahead and published it. Try to imagine how the opposite would be received if for example women were accused of being abusers with a need to behave better (which sounds just as wild) and the following outcry. I see from the comments section that some people are coming back to repost complaint comments they made earlier that have been deleted. I will have to do this too myself I imagine, as I posted that I will avoid all their brands from now on incl Proctor & Gamble toothpaste, shampoos ,etc. They seem to be deleting (including polite but critical) comments aggressively. The common people are beginning to refuse to accept this rubbish and speak out against it in greater numbers. And a gaffe like this is useful in marking stages of the normally obscured economic cycle. This can turn markets, overthrow governments (London, France street protests), and more. Watch sentiment and how it's change eventually alters the global power structure, cascading down to the price of houses, interest rates, pay increases or their size, etc which all affects everybody directly. Although it seems "wrong" until after you live through a few instances - seeing emotional change can help you to correctly time big life purchases. This trend has been a long time in growth and was first mentioned in Setup months ago. But it takes achievement of a critical mass to enable a matter to gain general attention. Critical mass is arrived. Decisions must be made on a plethora of fronts. pretty wicked damage for a gas leak don't you think? Wow, this is one hell of a trade war, not. "grew 17 percent from a year ago"
Hmm, that's one hell of a trade war, thankfully Trump is protecting the US worker and bringing jobs back to the US. Since my brother owns the shares, I thought I'd take a look. Looks like there could be an outstanding buy opportunity for a trade (or long term hold?) by mid-year as price works over toward R1. A mid-February dip to new lows (at MLH x R1) at about .22 could be a steal. Tx for the tip Pete, nasty dip there in the chart. There is definately a different vibe among many miners (not all). Breaking out of super long extremely boring consolidation patterns. We are going to have so much fun here in 2019. Maybe not so much outside in the society. Finally we got a new globalist friendly government in Sweden, after more than 4 months of negotiations. I truly bizarre constellation with communists-social demonrats-left globalist builderburger liberals trying to work together. What a nasty cocktail. Embrace populism (in latin it means by the people) now or we will take the risk that a new Napoleon-Stalin-Hitler-Pol Pot is born in Europe. Hey AM sounds like he is getting positioned for events in motion?? I always feel a little bit weak during full moons. My brother zapped around yesterday and stopped at a nature movie. A wolf had entered a different tribe of wolves and was in deep trouble. They started to chase him and finally he got caught and the fight for survival started. The lonely wolf lost and was killed by three other wolves. Is there a symbolic message in there, I don't know. I was thinking about the timing with the full moon. Two predators fighting. We were all ill at ease by witnessing the death struggle. Looks to me like a major pivot high in ES is in the making--a classic abc across the channel. The price action at the ml may have been a clue to this result, plus the fact that wave b-c never made its ml (from the low). A good hedge point, or outright short, imo. Today will probably wind up completing a "snap-back" reversal from the uh if you ignore the holiday trade bar. 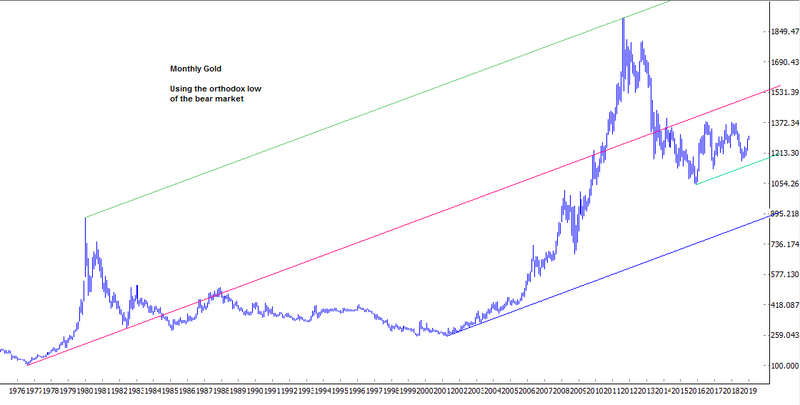 A pivot low in gold? After Jan 22 we move to the April chart. There was a large increase in April's volume with declining all-contract OI today. We may have seen the low of this correction. The odd thing is the low was made during the MLK holiday trading and not today. Price touched the top of the tight confluence of 2p, mod.Schiff far h, and 38.2%R as shown on the chart, closing higher than Friday. Should price now move higher, this pivot low could qualify as a Major pivot given its 5+ min-0 pivots on the daily. 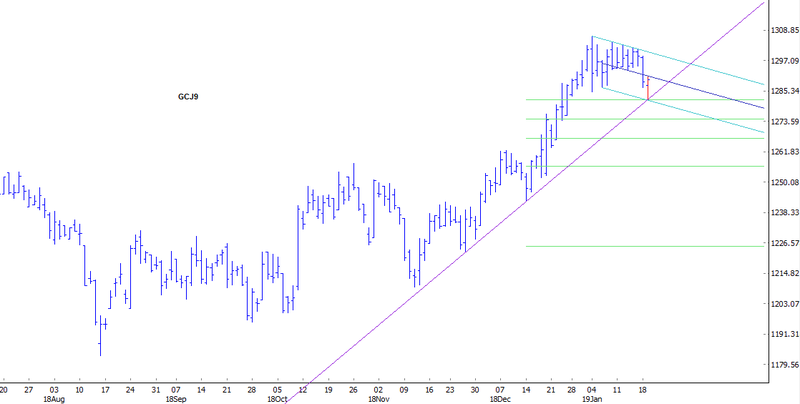 With only a 38.2% retracement of the last minor swing, a strong continuation higher would be expected, imo. In other words, the market is very strong and remains in a third wave higher. 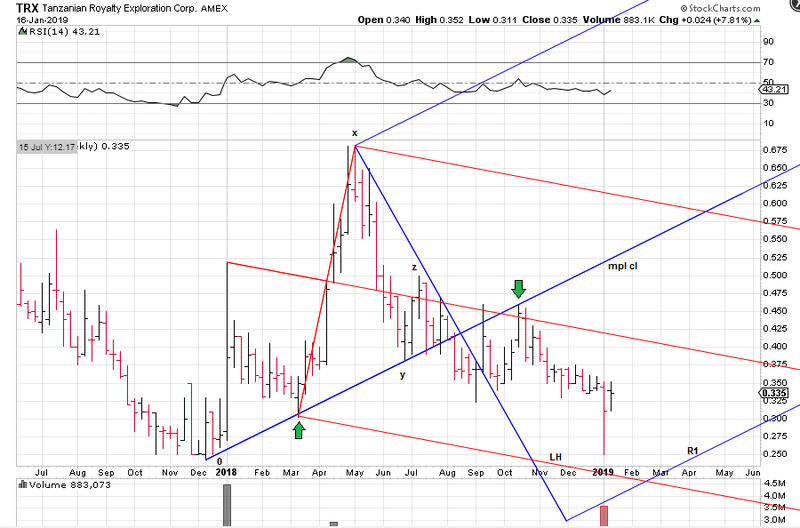 The Babson 0-y r1 tech can be used in gold's "B wave" to find a low for wave C (same pattern in April contract). Lends good support to thesis for a low in place. Is there a 2nd H bounce pattern in place? Yeah, no interest rate hikes in the EU. I thought when the central banks decided to throw in the towel on rate hikes, gold was going to shine? Obviously, it doesn't even matter because there's no inflation to defend. The same is going to happen if the central banks go back to QE, it's not going to matter. People have to be used to the concept of central bank controlled markets and zero ramifications as a result. I heard that another Ghostbusters is in the works, this time back to the story and not pandering to the latest thoughts on how we ought to be thinking. Gillette ad. Pfft. They must have done research showing women are doing the razor shopping so they don’t care what men think of the ad. They are still trying to recover after having made a razor with 7 blades...yes it shaves close but it doesn’t need replacing for a long long time. Oops. In the April chart the price low was made on the most important trendline, the 0-4 (0-y). Yesterday, the sharp but brief penetration of the prior low on the Babson R1 of the B wave (see prior post) did not negate the indication of higher prices from the r1 line (and other support) because there was no hourly close below the low. It was very brief, lasting no more than 15m (check for yourself). This happens sometimes. Anyway, it appears that the correction is over, or wave A of it anyway. So far, a really strong day. Is the golden balrog unleashed? Gold failing, not gonna happen I am bullish! Fester fans connecting the 2015 and 2018 lows. Notice the 1.62 line corresponds to the 2015 and 2016 1.00 line. Could be an important support line in the future. 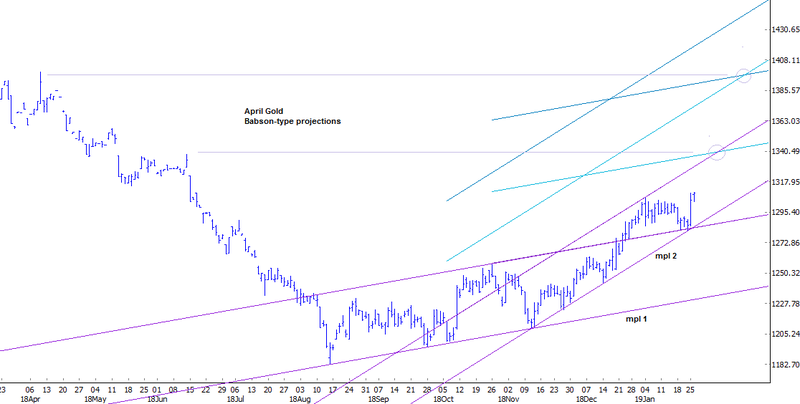 This shows a Babson-type price projection method for April Gold. If prices reach either of these points and other indications agree, they could mark weekly tops. 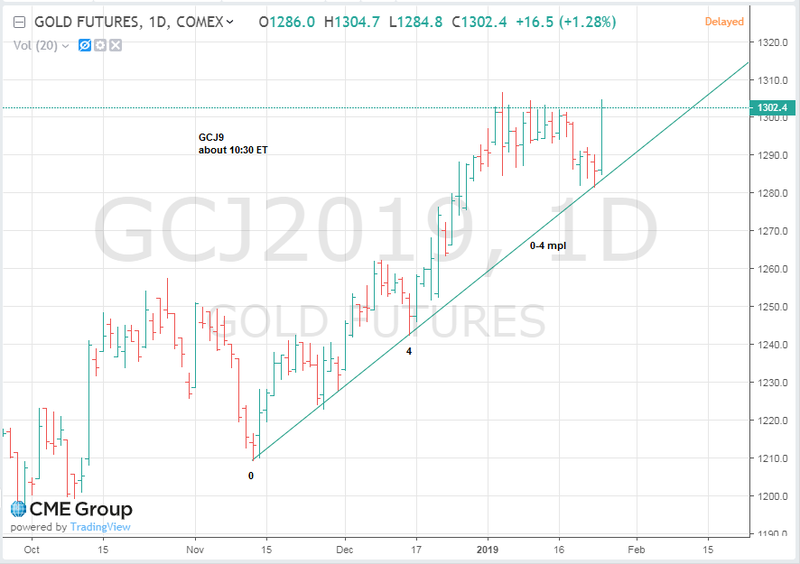 The weekly/monthly chart minimum target for GCM9 is the 2018 high of 1410.30 per the characteristics of a turn at/near R1.